One of the geometric models that researchers use to test shapes and designs for developing new energy-absorbing materials. 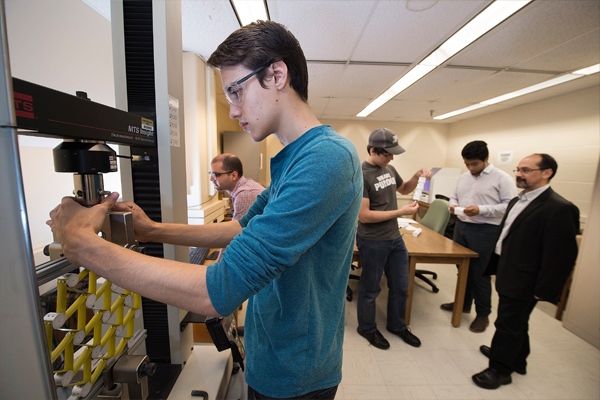 Undergrads create energy-absorbing materials Students in Pablo Zavattieri's lab help develop energy-absorbing, 3D-printable materials called "PXCMs." Students in Pablo Zavattieri's lab help develop energy-absorbing, 3D-printable materials called "PXCMs." Professor Pablo Zavattieri's research laboratory in the basement of Purdue's Hampton Hall of Civil Engineering looks like a toy shop or carpenter's workshop. 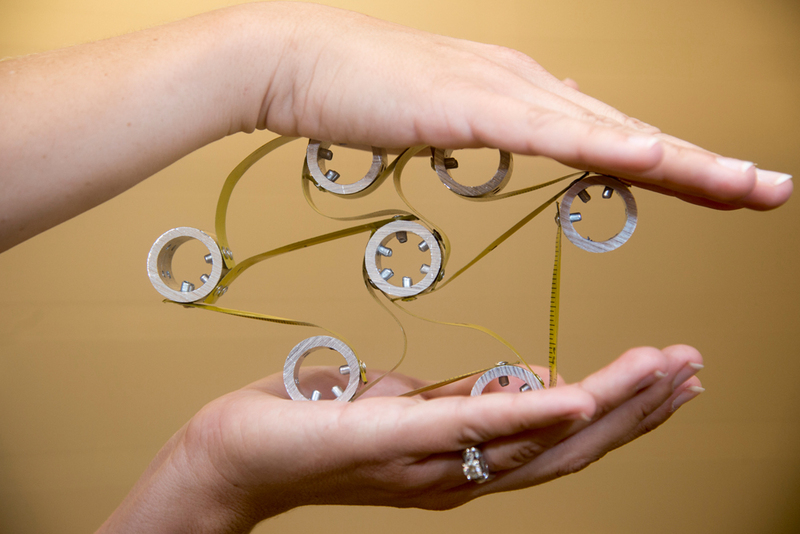 Geometric models, connected with splices of metal measuring tape and aluminum tubing, are scattered about. Nearby is a handful of brightly colored, triangular models made of orange, yellow, pink and green bendy straws. There are several foot-long, accordion-shaped origami paper models connected with a nut and bolt at each end that, when fully spun on their ends, rotate and collapse into an inch-thick disk. While seeming like toys or arts-and-crafts projects, these simple models help engineers test the shapes and designs and complex mechanics that will advance efforts for developing a new type of energy-absorbing material that might be 3D-printed. The energy and passion in this lab space comes from the vision and mission of Zavattieri's research goal — as well as from a core of undergraduate students who are crucial members of this team. The research led by Zavattieri, an associate professor in the Lyles School of Civil Engineering, is in partnership with General Motors Corp. and could have a profound effect on materials for impact-resistant automobiles, earthquake-resistant buildings, and even safer football helmets. This research is also funded by the National Science Foundation. "I have found it very valuable to have excellent undergraduates in the lab who are curious. They are passionate about contributing to the research we are doing, asking a lot of questions and challenging us every day," Zavattieri says. "What's more, these students are playing key roles in a type of work that breaks the stereotypes of civil engineering research, which can be as unpredictable and exciting as other engineering disciplines in terms of what the future holds." Zavattieri and his team are exploring the development of special materials — called phase transforming cellular materials (PXCMs) — that can absorb energy and help mitigate damage in the structural components of buildings, bridges and other large structures. Student teams are working with professor Pablo Zavattieri at his lab in the Hampton Hall of Civil Engineering for developing special materials—called "phase transforming cellular materials (PXCMs)"—that can absorb energy and help mitigate damage in the structural components of buildings, bridges and other large structures. 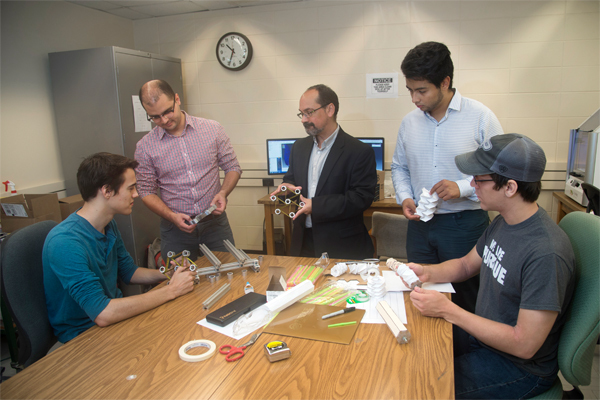 Pictured, from left, are Gordon Jarrold, a Civil Engineering junior, postdoc David Restrepo, professor Zavattieri, senior Civil Engineering student Cristian Tejedor and John Cleveland, an Aeronautics and Astronautics junior. John Cleveland, an Aeronautics and Astronautics junior from Scottsburg, Indiana, fabricated, tested and analyzed different versions of energy-absorbing materials, working closely with the bendy straws and origami PXCMs. Senior Civil Engineering student Cristian Tejedor of Colombia worked with Cleveland during the summer and has remained with Zavattieri's lab this fall. Gordon Jarrold, a Civil Engineering junior from Bloomington, Indiana, is studying specific types of PXCMs through computer modeling and computer-aided design (CAD) techniques. PXCMs contain unit cells that have multiple stable configurations, and the structures can flex back and forth and remain in either position indefinitely, not unlike a flexing playing card or a tape measure. Transformation between stable configurations in large chains of unit cells allows the dissipation of tremendous amount of energy after an impact or cyclic event. The super-elastic materials are reusable and less expensive than existing energy-absorption and damage-mitigating materials. Like other phase-transforming materials such as shape-memory alloys, PXCMs could be controlled using heat or other external stimuli. This concept of actuation also may prove helpful in making soft robots, which are flexible and able to conform to various shapes. "With current materials, the energy dissipation occurs with significant damage to the material, damage that is often permanent," Jarrold says. "The goal for our project is to contribute to the lab's efforts to develop new materials that are reusable even after a significant energy dissipation event." Undergraduate Nadia Aljabi with her PhD graduate student mentor, David Restrepo Arango, at the 3D printer. 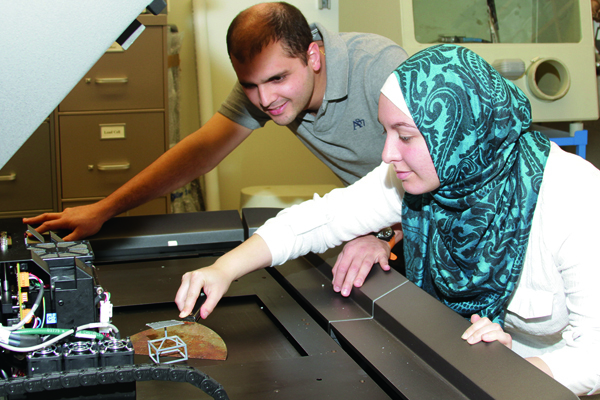 Nadia Aljabi, who hopes to pursue a doctoral degree in engineering or education, spent her summer of 2015 as a participant in the College of Engineering's Summer Undergraduate Research Fellowship (SURF) program, where she examined the fabrication method for PXCMs based on different approaches using 3D printing. Cleveland, Jarrold and Aljabi work closely with postdoc David Restrepo, a research assistant from Colombia. Restrepo, who completed his doctorate in December 2015, has expertise in the design, modeling, fabrication and testing of smart cellular materials, specifically multiscale modeling of naturally occurring, damage-tolerant materials and structures. He received the fall 2015 Civil Engineering Best Dissertation Award. "It has been an incredible and valuable learning experience," says Cleveland, a 2016 SURF participant. "I feel I am benefiting greatly from this hands-on experience and those many hours in the classroom." Adds Jarrold: "This project has been really engaging, and I've been excited about being able to apply what I've learned in the classroom about the basics in materials, structure and other concepts. I also feel Professor Zavattieri, Dr. Restrepo and the team have placed a tremendous amount of trust in me." 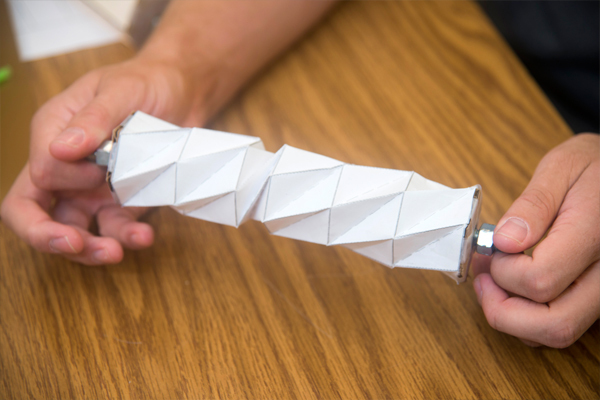 Aeronautics and Astronautics student John Cleveland works with an accordion-shaped origami paper model connected with a nut and bolt at each end that, when fully spun on their ends, rotate and collapse into an inch-thick disk. For her part of the PXCM project, Aljabi first designed her CAD models following analytical tools. Next, those models were 3D printed and assembled so researchers could explore the fabrication of PXCMs in different materials. She then examined the geometric design space of the PXCMs that exhibits phase transformation in two or more preferential directions. For this, the team developed 2D and 3D geometric designs, performing a parametric study by using 3D-printed models to explore the behavior of each cell. The results: The team observed that most of the 3D geometric models revealed the expected PXCM behavior under the same conditions — bi-stability and meta-stability, energy absorption and phase-transformation capabilities. These experimental results are important for the development of new theories and computational models that will be employed for the design of PXCMs for specific applications. "As a Civil Engineering student at Purdue, I am learning the necessary skills and technical knowledge to be an active contributor to society in a way that's beneficial and long-lasting," Aljabi says. The SURF experience also changed Aljabi's understanding of the many ways civil engineers can make a difference. "Now I realize this contribution can either be done as a direct field engineer or as an active participant in the advancement of science and technology through research." Gordon Jarrold, a Civil Engineering junior, readies one of his models on a universal testing machine in Pablo Zavattieri's lab to determine how it responds to pressure and stresses. In the background, Professor Zavattieri and his team are working with other shapes and designs. Restrepo also is very impressed with the quality of these undergraduates. He says he would not be surprised to see them publish their research findings from their work in Zavattieri's lab, in addition to the research posters they presented as part of SURF in August. Cleveland received the 2016 SURF Award of Excellence (Outstanding Research Talk) at the SURF Research Symposium for his presentation, "Mechanical Investigation of Phase-Transforming Cellular and Origami Materials." "It's very rewarding when you have motivated students asking lots of questions and excited about taking a research question to the next level," Restrepo says. "And we're seeing impressive results from the student research projects and will likely publish those results in a prominent journal." Zavattieri says undergraduate programs like SURF inspire talented undergraduate engineering students to consider industry or academic careers in research or to pursue a graduate degree. "Whether the students decide to go to grad school and stay in my lab or somebody else's is irrelevant," Zavattieri says. "I think, as faculty, we all benefit. So I may get students interested in doing an MS or PhD with me who did a SURF program with somebody else. In general, it provides all the stakeholders in the College of Engineering a mechanism to expose excellent undergraduate students to research. This is an opportunity that not all undergraduate students have — an opportunity where they can actually have an important role to play in high-end research."